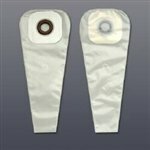 Hollister Karaya 5 Ostomy Pouch 16 Inch Length 22 mm Stoma Drainable from FirstOptionMedical.com is a natural skin barrier that is particularly well suited for skin problems or for sensitive skin where reactions may have occurred to other types of skin barriers. Karaya 5 seal rings have unique chemical properties that help prevent the growth of organisms that could be damaging to the skin. Karaya 5 seal rings are also slightly convex (approx. 2mm) and help fill in around stomas that are flush, recessed or retracted. Karaya 5 are flexible and can be stretched into shapes other than the normally round ring.